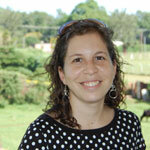 Veronica Ades is an OB/GYN on her first MSF mission in South Sudan. In this post from her "Love, Labor, Loss" Field Blog, she describes her experience in the MSF hospital in Aweil. 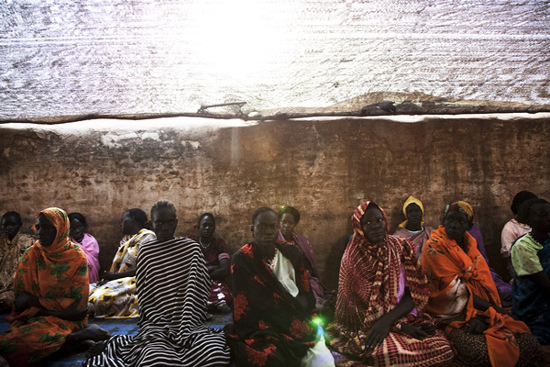 Sudanese mothers wait to see a doctor at the MSF maternity/pediatrics department in Aweil. The woman was sent from the Ministry of Health (MoH) section of the hospital. MSF operates the Maternity Ward, the Pediatric wards, and the therapeutic feeding center. The rest of the hospital is under the direction of the MoH. We are not sure why she was sent, but there is a written request to check hemoglobin. The midwife has checked it, and it is extremely low at 4.4 g/dL. If I had a hemoglobin this low, I would probably be dead, but people here are generally so anemic that they are physiologically more adjusted to it, and can tolerate very low levels. Nonetheless, she is symptomatic. She is visibly tachypneic (fast breathing), tachycardic (high heart rate), and she looks weak and miserable. There is some confusion about what to do with her. She is quite sick, but we only manage pregnant women. If she is not pregnant, then the MOH should manage her. We learn that they had already given her one unit of blood—her original hemoglobin on arrival was 2.9 g/dL. Good grief. But why did they send her to us then? She arrived with a piece of paper, ostensibly a referral, but it is in Arabic. We decide to do a pregnancy test, and if it is negative, we will send her back. It comes back positive. We put her in a bed, and the maternity manager (who is a midwife) examines her while I see other patients. She asks me to come and look at her ultrasound. She shows me the uterus, and it looks empty. She moves the ultrasound probe to the right, and suddenly a very clear pregnancy appears—outside the uterus. The patient has an ectopic pregnancy. That may or may not explain the anemia. If the ectopic ruptured and she bled into her abdomen, that would make her very anemic, but we don’t see any free fluid in her abdomen, and she doesn’t have any abdominal pain. She did have abdominal pain two days ago, she tells us. Strange. We contact the blood bank. There is a very tiny amount (a pediatric unit) in her blood type, and there is one unit available of O-positive, which she is also able to receive, and one unit of another type that she cannot receive. That leaves us with a problem: we can use the O-positive blood, but that blood is very valuable because it can be given to most blood types. If we give it to her, then the next person who comes in with a life-or-death need for blood will die. She is definitely sick and needs the blood, but exactly how much does she need the blood? Is it possible that she will tolerate the surgery without the unit? She might not lose all that much in the surgery. And she is young, so her heart is strong. Would another person need this unit more than she does? This is never a problem we need to think about in the United States. If someone needs blood, they get blood. Blood is a precious resource, but it is an available resource. An additional problem in South Sudan is that there are some cultural beliefs about giving blood that make blood donation almost impossible. On occasion, we have been able to convince people to donate for their gravely ill family members, but no one donates blood for strangers, and even for family it is a challenge. Many anemic pregnant women have languished weakly on the wards for lack of a family member willing (or able) to donate. We explain to the woman’s family that she needs surgery, and blood. They immediately agree to the surgery—“anything that is needed to save her life,” says her husband. We send him and her mother to the blood bank to see if they are candidates for donation. They are not. When we get back to the patient, we learn that her brother arrived and was sent to the blood bank for evaluation. She can receive his type, which is very lucky. He has donated 450cc of blood. I shake his hand, and tell him that he has saved his sister’s life. We decide to hang the blood in the operating theater (OT), just before the surgery. That way, if her ectopic ruptures before I get to it, she won’t have time to lose too much of the transfused blood. I remove the tube. She doesn’t lose much new blood in the process. I look at her left tube—it doesn’t look great, a little scarred, a little dilated. She probably had some kind of infection that caused pelvic inflammatory disease, leading to tubal scarring and trapping this pregnancy in her right tube. I leave both ovaries and her left tube in place, and hope for her sake that she is able to get pregnant. (She has three children, but told me she wanted more).